Wilkesboro, NC -- One of the annual highlights of MerleFest is the Chris Austin Songwriting Contest (CASC). Finalists were selected earlier for this year's annual Chris Austin Songwriting Contest, hosted by MerleFest 2013. Now in its 21st year, the contest is an extraordinary opportunity for aspiring writers to have their original songs heard and judged by a panel of music industry professionals, under the direction of this year’s volunteer contest chairperson, Grammy®-winning singer/songwriter Jim Lauderdale. MerleFest 2013 took place April 25 through 28 on the campus of Wilkes Community College in Wilkesboro, North Carolina. This year, John Cloyd Miller captured the first place prize in the Bluegrass category in the annual Chris Austin Songwriting Contest. The CD Eyes Wide Open brought Jeff & Sheri Easter the honor of Country Gospel Album of the Year at the Absolutely Gospel Awards on April 9. "We're so excited about Eyes Wide Open and the messages that it offers,” Sheri said. “It's all about living with eyes wide open and hearts full of gratitude and that's a wonderful perspective to have. It's amazing how just a slight detour from your routine can make you truly grateful for the things that are important in this life. Boston MA, March 19, 2013. Berklee College of Music president Roger Brown will present Carole King, Willie Nelson, and Annie Lennox with honorary doctor of music degrees at Berklee's commencement ceremony, Saturday, May 11, at the 7,000-seat Agganis Arena at Boston University. Commencement speaker Annie Lennox will address more than 900 Berklee graduates, their parents, and invited guests. The European Bluegrass Music Association (EBMA) board along with a special Selecting Committee formed by Lilly Pavlak, Richard Hawkins, Christian Seguret, Paolo Dettwiler, Bruno Steffen and Eberhard Finke happily announced that Niall Toner has been appointed as the recipient of the first EBMA European Bluegrass Personality of the Year award. The announcement was made by EBMA Board Member Martino Coppo Wednesday, March 6, 2013. The 55th Grammy Awards were held last night and the Steep Canyon Rangers captured the coveted Best Bluegrass Album for their Nobody Knows You album. The group had some outstanding competition with Dailey & Vincent, The Grascals, Noam Pikelny and Special Consensus all nominated for the bluegrass music award. The crème de la crème of the concert industry descended upon Los Angeles’ Club Nokia at L.A. Live Feb. 7 where they networked, bellied up to the full-service bar, scarfed down the very expensive, catered delicacies and networked some more. And some of them got to take very special items home with them – a coveted Pollstar Awards plaque. 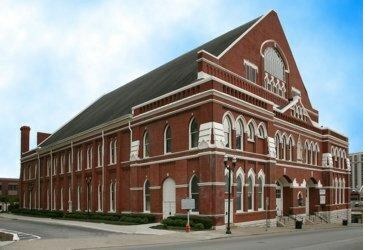 The Ryman Auditorium was Named Theatre of the Year for the third year in a row during the 24th Annual Pollstar Awards. Nashville, TN -- January 29th, 2013 - Producers of the acclaimed PBS music concert event series Bluegrass Underground today announced that the series is a proud recipient of a coveted EMMY award from the 27th Annual Mid South Emmy Awards. The honorees were announced January 26th in a ceremony at the Schermerhorn Symphony Center in Nashville, TN. 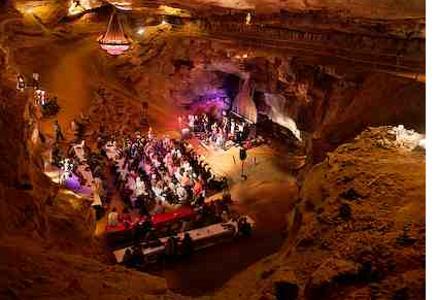 Bluegrass Underground is a live concert and radio show held inside the Volcano Room -- an amphitheater 333 feet underground, one of the most acoustically pure natural spaces on or under the earth. The Northern Bluegrass Committee has announced the winners of the 2012 Central Canadian Bluegrass Awards. The Committee congragulates all of the recipients and to all the nominees. It is a lot of work for the people involved in this business but, if you love bluegrass, its just a whole bunch of fun too! This year's attendance was almost a thousand bluegrass fans and friends. Dr. Thomas Adler worked to get one of America's legendary banjo artists his due. Adler announced that the University of Kentucky Board of Trustees has designated bluegrass music banjoist and bandleader J.D. Crowe as one of the recipients of an honorary doctorate. The Doctor of Arts degree was conferred at a Commencement ceremony in Lexington, Kentucky, on December 14th, 2012. Prestonsburg, KY -- Acclaimed vocalist and guitarist, Charlie Sizemore has been recognized by Big Sandy Community and Technical College in Prestonsburg, Kentucky as a Distinguished Alumni of the Year for 2012. Sizemore attended the school (then Prestonsburg Community College) from 1986-88. While there he was instrumental in forming the Alpha Nu Zeta Chapter of Phi Theta Kappa, the honorary society of community and junior colleges and became its first president. He also was named to Who's Who Among Students in America's Junior Colleges. Each year, United States Artists honors 50 of America's finest artists with individual fellowship awards of $50,000 each. Celebrated and innovative banjo player Tony Trischka has inspired many other progressive players and is one of the 2012 recipients. Trischka started playing the banjo in 1963 and played with numerous bands until the 1980s, when he began recording with his band, Skyline, and worked on the soundtrack for Driving Miss Daisy. His 2007 album, Double Banjo Bluegrass Spectacular, featured appearances by Steve Martin, Earl Scruggs, and many other banjo luminaries, and received two International Bluegrass Music Association (IBMA) awards as well as a Grammy® nomination. Trischka also received an IBMA award for Banjo Player of the Year.